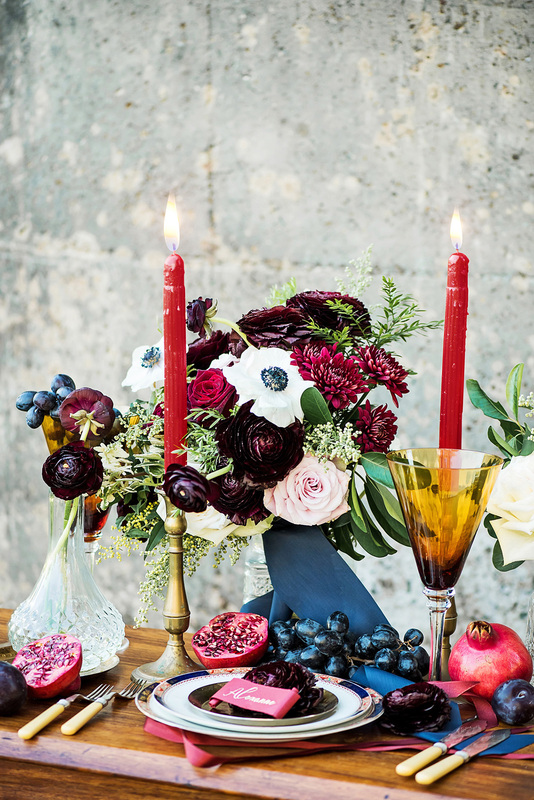 Romantic Burgundy Red and Navy Blue Wedding Ideas. 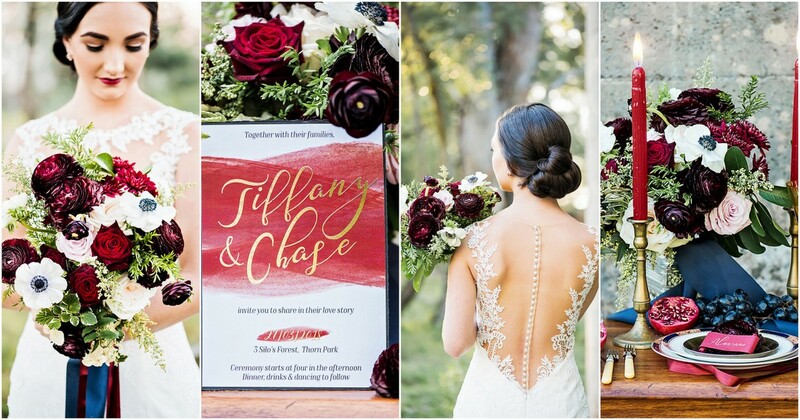 Find ideas for your romantic burgundy red and navy blue wedding – from bouquet, to invitations, to place settings, wedding floral arrangements, hair, make up and more! 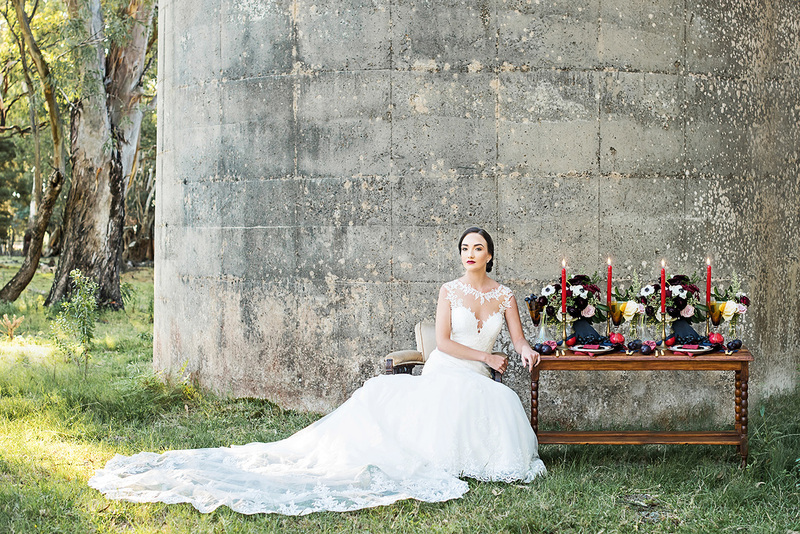 Set in the woods, against the backdrop of nature, this beautiful wedding inspiration is filled with warm, deep colours and classic bridal elegance. Deep reds, blacks, burgundy, navy and warm wood tones are combined, complimented with touches of gold for breathtaking results! Astrid Bradley Photography captured these timeless photographs. 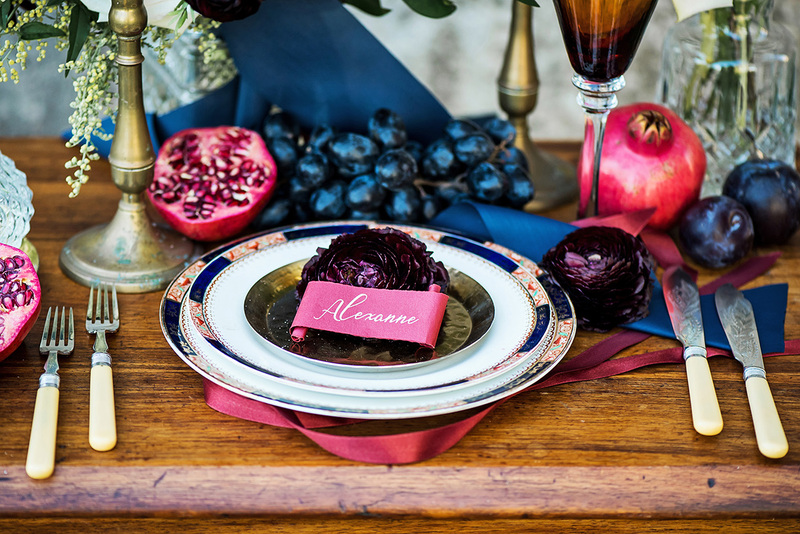 Below she also shares expert tips for gathering the items used to create this burgundy red, navy blue and gold wedding inspiration. We’re in love! Burgundy red, navy blue and gold wedding stationery: Confetti Designs created a custom designed, moody inspired wedding invitation for this burgundy red, navy blue and gold wedding theme. 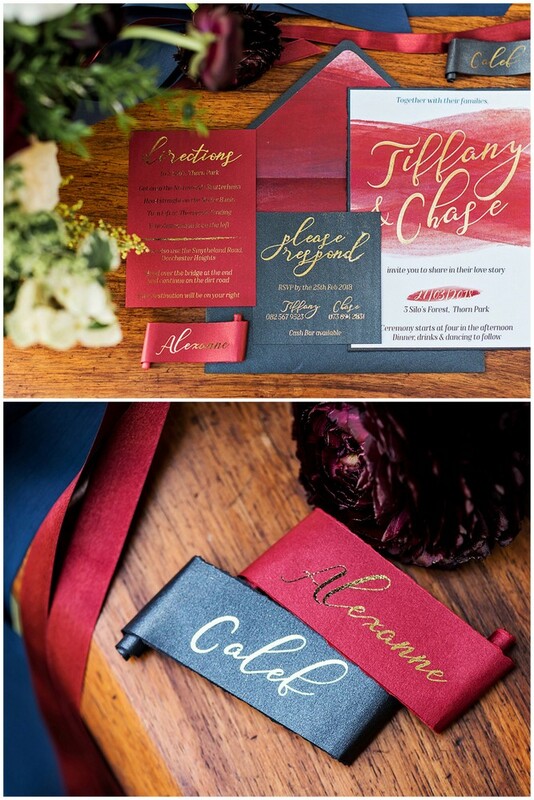 The invitation used deep reds and charcoal colours with a touch of gold. Torn edges and scroll-styled place cards created an old world antique feel with a water colour effect on the main invitation to add a modern, fresh approach. 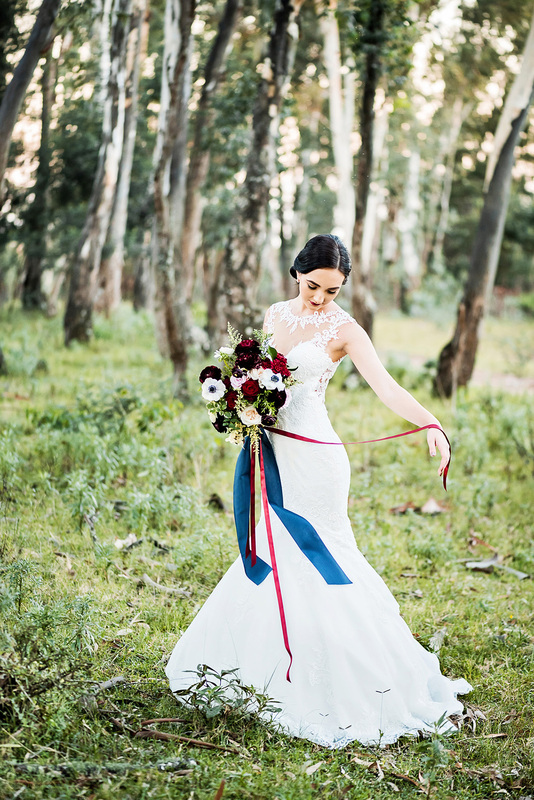 Burgundy red and navy blue wedding bouquet: This winter inspired floral art bouquet by Sarah May was created using burgundy ranunculus and rich, black barraca roses with touches of dirty pinks and white hara roses. The white and navy blue anemones tied the look together, complimenting the burgundy red and navy blue wedding decor and stationery choices. Burgundy red, navy blue and gold wedding table decor: Brass candle holders, decorative porcelain plates, crystal glasses and engraved antique cutlery all came together to create an authentic and unique, one-of-a-kind table setting. Winter fruits ranging from deep reds to black, tied the look together. Kim’s Corner provided and array of vintage and antique pieces to create a beautiful look for this shoot. Wedding Dress: The gown’s long train, intricate lace detail and pearl buttons down the back of the dress created an elegant look and classic bridal silhouette. Lady Marmalaide provided one of their new and exclusive wedding gowns from the gorgeous L-Langley Collection. 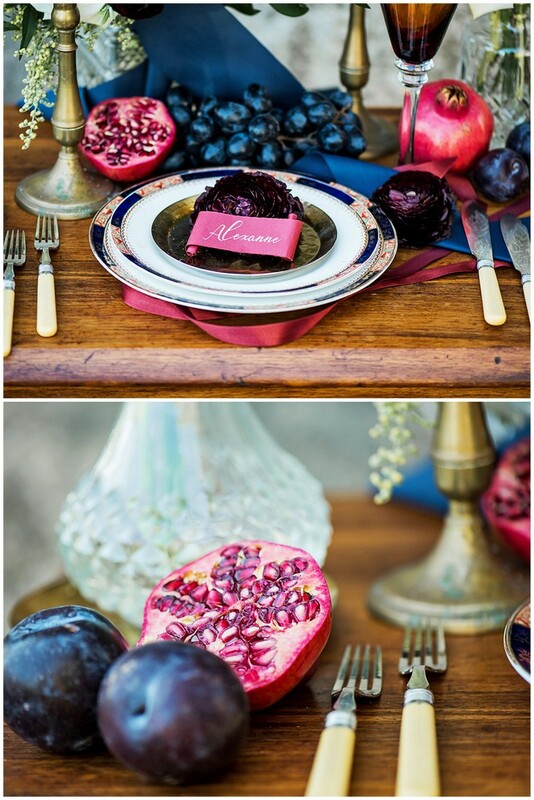 Burgundy red and navy blue wedding table setting using pomegranate fruit and berries, with touches of gold. Wedding Makeup: This 50s glamour look was achieved by using a deep red tone on the lip complimented with pristine eye makeup. Eyebrows and lashes were also enhanced by Kelly May Makeup Artist to frame the eyes, keeping the makeup simplistic, but classic. 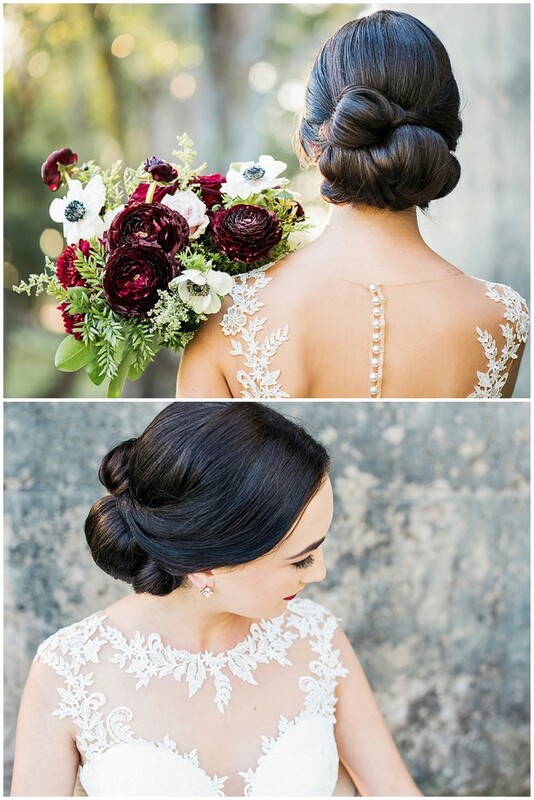 Above: Classic low-bun wedding up-style. The warm natural light of the sun going down between the silo’s and the trees created a clean and authentic backdrop. Tall grey, concrete silos at the ‘3 Silos’ location provided a beautiful raw texture for the backdrop. The trees along the trails made the ideal location to capture the woodsy, cosy and dramatic forest look. Learn how to achieve a romantic burgundy red, navy blue and gold wedding look with these essential tips from the Astrid Bradley photography, who captured this wedding inspiration. Choose a season + venue which complements your color palette. 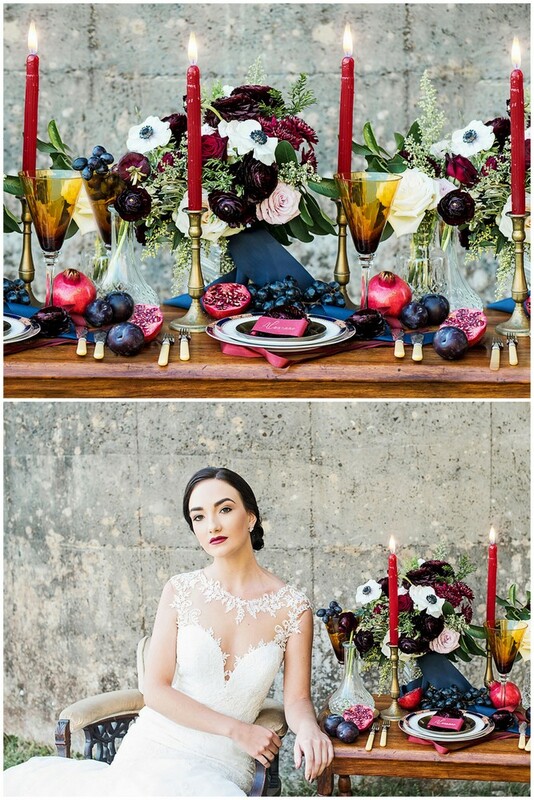 A burgundy red and navy blue wedding theme is perfect for winter or autumn. Cold season weddings can work quite beautifully in forest areas, creating a cosy, woodsy atmosphere for the celebrations and photographs. But be sure to get a few outdoor heaters and blankets if the temperatures are predicted to drop. A venue with an indoor reception area is an absolute must if you are wanting to plan for a cold winter wedding. Fruits create beautiful textures and colours. Don’t be scared to add colour to the table through items other than flowers. They are also a good filler to use on empty spaces on tables and work out to be more cost effective than flowers. 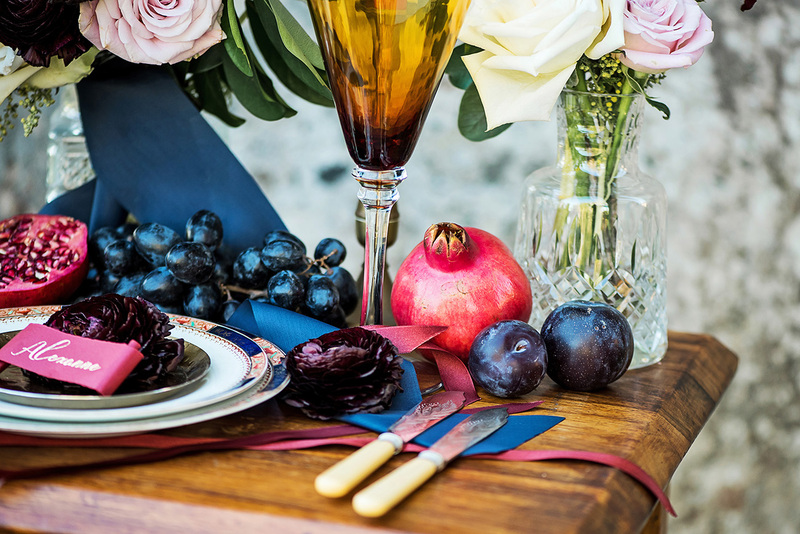 See what fruits such as pomegranates, grapes, blueberries, cherries and strawberries are in season and work those colours in with the theme of your wedding day. Collect vintage bottles, glassware and plates from antique shops and thrift to elevate the overall look of the day. When selecting a decor company, look for one with authentic and unique items. A place that allows you to mix and match chairs or plates would be a winning combo. Choose one dominant colour and add dimension with creamy tones, golds and a complimentary colour pop in small areas of the wedding. Keep it simple with the colours. Add height to the table setting by using single candle holders and bring in even more depth by choosing a deep red or charcoal coloured candle sticks. Can we all say goodbye to the humble white tealight candle? Choose a wedding dress with intricate lace or bead work to make a grand entrance down the aisle. A long train is a must if you are wanting to add dramatic appeal to the look. Gold foiling instantly adds a bit of pizzazz to an invite or place cards. Keep jewelry to a minimum. If you have chosen a dress with a lot of detail or high neckline, skip the necklace and bracelets, and let the dress speak for itself. Less is more. A dainty choice of earrings with your wedding band is all you need to look like an elegant bride.